Here�s a weird shadow anomaly I�ve been meaning to talk about years ago, but forgot about it. Until I happened to bump into it again this week! Left is a polygon mesh made from 3 cubes, combined with boolean union, converted to polygon mesh and then the edges smoothed in polygon editing window with the bevel tool. Right are 3 separate cubes converted to polygon meshes with the edges smoothed with the fillet tool. They are still separate polygon meshes because if you combine them the fillet tool doesn�t work as desired. On the left mesh you see a strange shadow along the bottom edge. On the right there�s nothing wrong. I managed to find a work around or should I say repair method, but it�s not a real solution. It just works although you need an extra rendering. It involves hiding elements in the direct neigbourhood, even if it doesn�t touch the mesh! 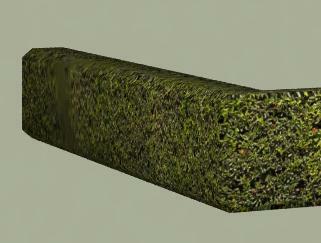 And then pasting the rendering of this element into the first rendering (with the terrain, grass, cycle path and street). You might try turning on or off the Shadows render setting "interpolate polygon shadows" and see if that helps. What exact version fo Design 3D CX are you running? Can you provide the model file? If you don't want to post a link here, you can send it to Strata Support. Ah, thanks! That did the trick! Never thought of playing with that setting. Strata Design 3D CX 8.2.2. Kevco, Could this be related to odd shadows being caused by the default smoothing angle of 60 degrees on mesh objects? Lowering to 20 usually fixes it. Yes, it looks like that's it. I lowered the polygon mesh objects smoothing angle from 60 to 20 and that appears to have taken care of it.